Accel supplies comprehensive daily nutrition for horses in a well-rounded blend of over 40 essential and non-essential nutrients for all types of horses. This formula supplies all of the recognized water and fat soluble vitamins, including many that are missing in most other supplements, for well-rounded support of the vitamin needs of most horses. The more readily absorbed trace minerals, selenium and iodine, are supplied in conventional forms. Accel also supplies five macro minerals to help balance and fortify your basic feeding program. Calcium and phosphorus are supplemented in the ideal 1.4 to 1 ratio, along with magnesium, potassium and sulfur. Accel contains fourteen amino acids, the building blocks of protein. If any one of the essential amino acids is deficient in the diet, the process of protein building is cut short. Accel's generous supply of lysine and methionine, the two essential amino acids most often lacking in equine diets, helps keep the "limiting amino acid principle" from limiting your training success. Accel also supplies high levels of the branched chain amino acids, valine, leucine, and isoleucine, which are important to cellular energy release. Accel fortifies the digestive tract with four digestive enzymes, plus a seven culture direct-fed microbial complex. These beneficial micro-organisms are compatible with equine digestive systems. For intensive training or performance, or during breeding, gestation and lactation, feed 2 ounces (2 scoops) daily. 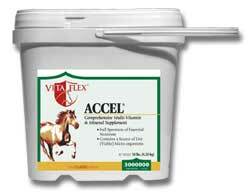 For mature horses, idle to moderate activity, feed 1 to 2 ounces (1 to 2 scoops) daily. For weanlings and yearlings, start at 1/2 ounce daily and gradually increase according to body weight.